Lady Emily Ashton is a young Victorian widow who shocks society by being nice to her servants and has a liking for vintage port. She also has an avid interest in ancient Greek, and persuades owners of antiquities amongst her friends and acquaintances to donate them to the British Museum in order for the world to enjoy them. This is Tasha Alexander’s second novel featuring Lady Emily, whose early demise of her aristocratic husband has left her with considerable wealth and independence which she fully intends to emloy n her new life and recently discovered interest in seeking out murderes in London society. After giving some advice to an acquaintance who was robbed of a pink diamond, Lady Emily is horrified when the man is murdered by poison. She sets out to discover who killed him and with the help of her ardent admirer, Colin Hargreaves and her equally unconventional friends, Margaret and Cecille, Lady Emily uncovers rocks which would prefer to remain unturned. Dogged by the attentions of an anonymous admirer who seems to be one step ahead of every move she makes, she risks being ostracised from society for her persistence. Her enemies are also spreading untrue rumours about her relationship with an eligible duke which could ruin her. WhenLady Emily discovers the pink diamond was a posession of the executed Queen Marie Antoinette, and that other former possessions of the late queen go missing, some from her own house, Emily is determined to find out who the culprit is. The appearance of the odious Charles Berry, who claims to be the descendant of the executed Louis XVI, muddies the waters. He makes it clear he intends to reclaim the French throne and insists a faction exists in France more than wiling to help him re-instate the monarchy. When he makes it clear he would like to make Emily his mistress when he is king, Lady Ashton is not flattered but furious. More than one attempt is made to harm her, but while the ever faithfull Mr Hargreaves does more than pace the floor and chews his knuckles, Lady Emily will not be persuaded to abandon her search for justice, especially when she is certain the police have arrested the wrong person. Emily Ashton is a worthy heroine with an iron will she contains within an enigmatic exterior. She has the presence of mind and mental resourcefulness to ignore what she finds tedious, even when the situation threatens to get out of control. I did find her domineering mother, Lady Bromley, delightfully infuriating. When the butler announced her arrival I settled in to enjoy an outrageous exchange between her and her patient daughter. However, Lady Bromley more than vindicates herself when she steps in the rescur her disobedient daughter's reputation by trotting her along to tea with Queen Victoria. Colin Hargreaves is the attractive, enigmatic hero who has a mission of his own, not to mention friends in high places. He works behind the scenes very satisfyingly to keep his beloved safe. Ms Alexander portrays Victorian society beautifully in this mystery laden with the atmosphere of aristocratic London. The narrative contains enough surprises, colourful characters and clues scattered amongst the roses to satisfy lovers of both the romance and mystery genres. I could hear the silk rustle and the gates of the square clang shut. I became quite worried for Lady Emily on occasion, when her quest for total independence sent her into London’s parks to bait her secret admirer. Definitely a cold winter evening cuddled into a wing chair with a hot chocolate at my side book. Which I will certainly do with her next in the series, 'A Fatal Waltz'. We hope you enjoyed this review of. Ms Alexander has offered a copy of. 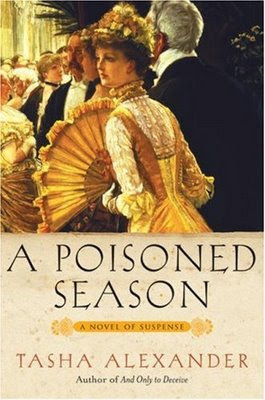 'A Poisoned Season' as a prize so, do leave a comment on this blog. The winner will be notified by e-mail and asked to submit a mailing address so we can send the book to you. Based on Anita's synopsis, to say that Lady Ashton is a woman ahead of her time and something of a societal rebel would indeed be an understatement. Her life and enterprises would rival any current-day prime-time TV show. I'm intrigued and will be looking for this one at my next bookshop stop. Interesting way to conduct an interview. I really enjoyed. I'll put your books on my wish list! Lady Ashton sounds like my kind of heroine, brave, smart and independent in a society ruled by class and reputation. I'll be on the look out for this one! Sounds great ! I'm putting on my TBR list !